The U.S. Agency for International Development (USAID) reports that 18,000 more children and 650 more mothers will survive today than each day in 1990. While this is great progress, 5.9 million children and 303,000 women still die every year for reasons we know can be prevented. Overcoming the barriers to maternal and child survival was the core theme of the 2017 Acting on the Call Summit that took place August 24-25 in Addis Ababa, Ethiopia. This summit was the fourth in a series of Acting on the Call events which began in 2012. 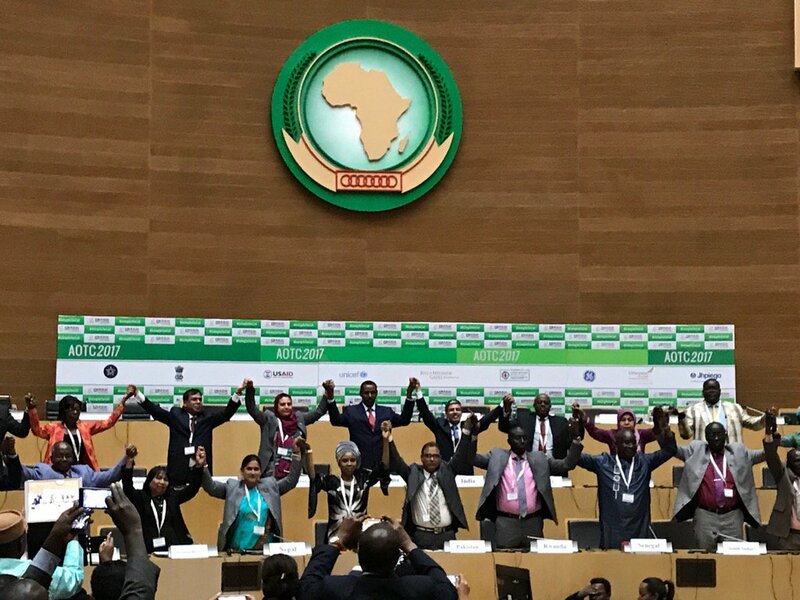 Here in Addis Ababa, the governments of Ethiopia and India joined partners such as the Bill and Melinda Gates Foundation, UNICEF, and USAID to convene delegates from 24 countries to re-affirm their pledge to saving more lives and discuss lessons learned from their in-country health initiatives. Discussions around overcoming these barriers to maternal and child survival exposed that building a robust health workforce and leveraging data with appropriate technology for evidence-based decision-making will be two of many areas to focus on to uphold the 2030 Sustainable Development Goal commitments. Leveraging data via technology to maximize the impact of maternal and child health programs continues to be at the forefront of many discussions. A collaboration between Johnson & Johnson, Every Woman Every Child, and FHI 360 is doing just that. The Newborn Survival Map encourages the development of cross-sector partnerships delivering integrated solutions. How? By crowdsourcing data. The project is targeting current, large-scale investments (USD500,000 and above), public and private, across four major sectors in the 16 countries with the largest numbers of maternal and newborn deaths. Once complete, the Newborn Survival Map will provide a platform to expose cross-sector opportunities for closer collaboration among partners currently in close geographic proximity. In addition, it will reveal critical gaps in cross-sector services that could prevent the deaths of many more pregnant women and newborns. The map is still seeking data and anyone working on a related project is encouraged to submit their program information. The Newborn Survival Map is one of many initiatives leveraging data and technology to advance progress towards ending preventable maternal and child deaths. In further conversations about data at the AOTC event, multiple presenters provided roadmaps for country and program leaders to use to improve health outcomes. The 2017 Acting on the Call Summit concluded with all 25 country delegates committing to reducing mortality, put their country on a sustainable path to ending all preventable maternal, newborn and child deaths. and achieving universal health coverage. This commitment has been documented in what is now called the Addis Declaration. Since the initial Acting on the Call Summit in 2012, great strides have been made to eliminate the number of preventable maternal, newborn and child deaths. USAID has reported that over 13 million health workers have been trained in maternal and child health and nutrition, and over 5 million women have been able to give birth in a health facility. While there are still mothers and children unable to access proper health services, the Addis Declaration is the next step forward to ending preventable maternal, infant and child deaths.